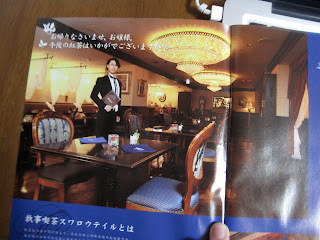 For the birthday party I had with friends, I decided to make a reservation at a butler cafe. I was originally thinking about the butler cafe where all the employees are cute foreigners, but that dream was killed when I found out that they don't really speak Japanese. I wanted to be called お嬢様, darn it (o-jousama is a term for a daughter of a wealthy family. I got kinda obsessed with a drama about a butler and an お嬢様 detective so you can't really blame me, right?). 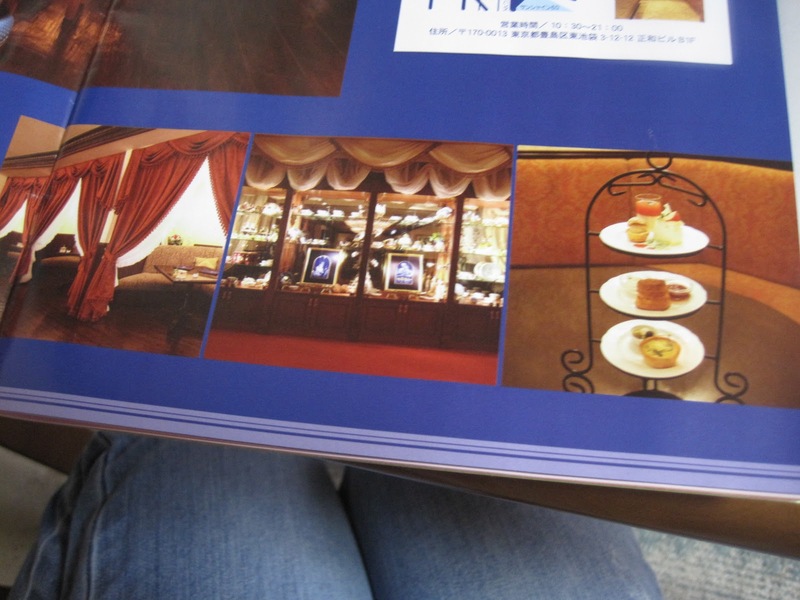 So I decided on Swallowtail in Ikebukuro, which is, I'm pretty sure, the first butler cafe in Japan. Might as well go for the cream of the crop. The basic concept of a butler cafe is that you are extraordinarily wealthy and you're returning to your mansion for dinner/afternoon tea. The butlers great you with 「お帰りなさいませ、お嬢様！」"Welcome home, my lady!" and take your coat and carry your bag to your table and make small talk with you and serve you tea and generally make you feel like a fantastic person. It's not cheap, but you get really good tea, really good service (where else can you ring a little bell and have someone actually respond to you? 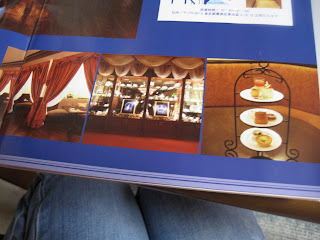 ), good food, and you can drink out of fancy tea cups in a place that basically looks like a ballroom but is somehow under a Family Mart convenience store. You aren't allowed to take pictures inside, but luckily I got a flyer when I bought manga at K-Books that had a lot of pictures in it, so you'll get to see those. Pretty sure our butler is not pictured here but it gives you an idea of the staff. Inside the dining room. We sat at tables like this. On the left is little curtained off two person tables. I'm not sure how you get the ability to sit at one of those. And on the right is the set of tea snacks that I ordered. It was way more filling than I expected it to be. It comes with a pot of tea and I ordered a strawberry tea on a whim, ("Hephaistos," I think... the birthday tea for April) and it was amazingly delicious. Here we all are outside of the entrance, where we were allowed to take pictures. Me in the middle in the blue dress and the 5 friends I could convince to come with me. The whole experience was really enjoyable, and I can understand how people could get kinda addicted to it. The butlers are super polite and friendly and complimentary. Like, they told us our Japanese was so good that we didn't really need to study, and when our butler told Matt that he was very nice for something he said, I teased him about being so late that we had to run there in order to make it on time, and the butler said that because 旦那様 "danna-sama" the master is so kind, certainly he must have all sorts of errands to run and people he needs to talk to, or something like that. Like, I wish I had that kind of class, to respond to everything with flattery. Though the butlers do get trained for a month before they can even start work. My friend commented that in the US the place would be a black tie restaurant, but it manages to not seem that uncomfortable. I think maybe it's the idea that the butlers keep telling you that this is your mansion. That way you don't feel too weird if you eat with the wrong fork or something. Please ask if you have any questions about specifics. I'm not sure what I should be writing about here exactly, but Swallowtail was a lot of fun, and I recommend it. It sounds like a dream come true. What a great place to go for your birthday. I am so glad that you were able to get a group to go with you!